Voter registration is a critical step for expanding the voting population. But the prize is changing behavior so unlikely voters become routine, and informed, voters. 9to5 created the 4-part Power of Participation series so our base, primarily women of color, could engage with each other on key issues related to voting and decide for themselves if voting matters, and more importantly if their votes matter. For our communities it’s nearly impossible to build and maintain structural power if we don’t participate in the political process starting with voting. 9to5’s experience is that changing voting behavior in low-propensity voters, especially over the long-term, is not something that happens quickly. We recognize that the barriers to voting for the people we work with are substantive, often deliberate, and intersecting. • Session I: They don’t want you to vote! • Session II: Your vote really counts! 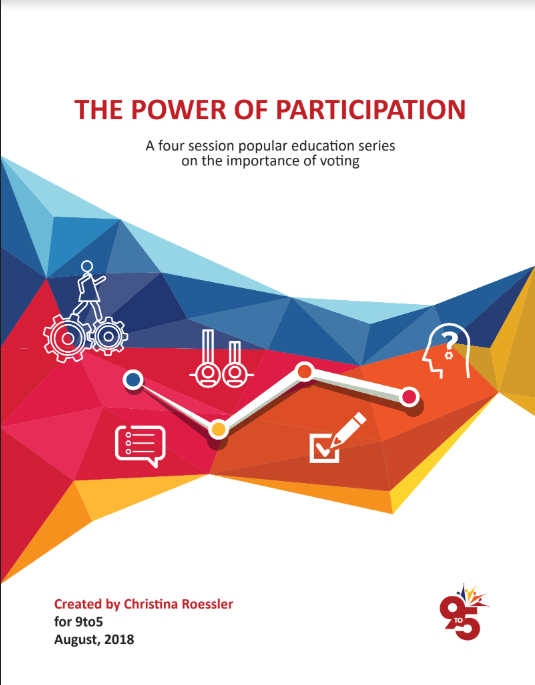 9to5 encourages movement organizations to use the Power of Participation with your own constituencies. We’ve offered it to diverse constituencies in many different settings and have always found it to be very successful. For inquiries, please send an email with the subject line “Power of Participation” to 9to5@9to5.org.